I'm gradually working on getting everything all organized and put together in my craft room. I thought I would pop in to share my newest embroidery project that I've hung on the front door! I love it! It's very girly, just like me and my whole craft room! I traced text off of my computer for the letters: big and bold for the caution and fun and curvy for the rest! 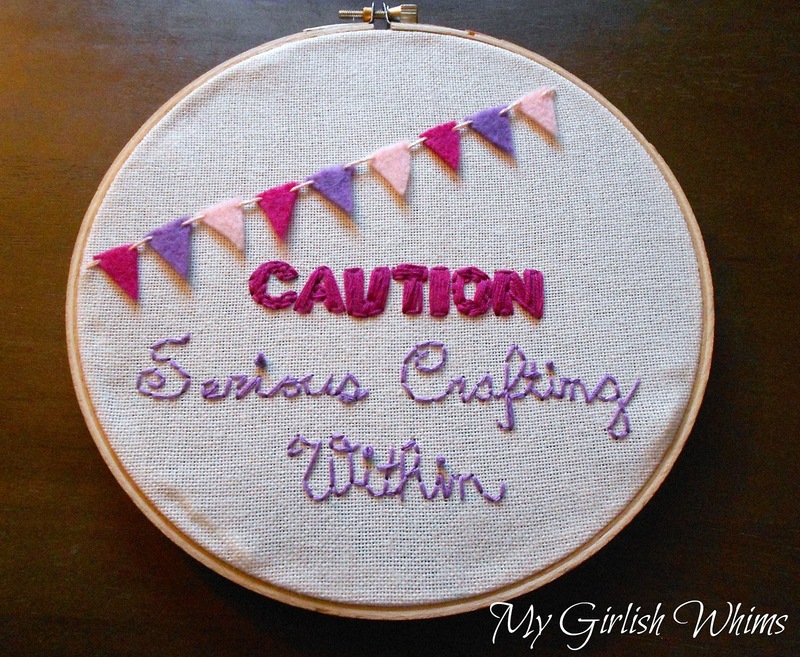 I have a few more craft-themed embroidery projects planned to hang as decor. They're fun to do and are great for doing while just sitting in front of the TV with the hubs! So very cute, so you!! Love it! Can't wait to see you room! Awwww this is adorable!!!! What a cute idea! I will be back. I can't wait to see what's behind the door. I'm working on my craft room too and love ideas! Came by from More the Merrier linky party.